(L to R) Chancellor Ray Wallace, Vice Chancellor Dana Wavle, IU Vice President John Applegate, Patty Cress, IU Foundation Jonathan Purvis, Vice Chancellor Betty Russo and Director of Development David DeWitt at the Cress Lobby dedication at the Ogle Center on April 14, 2018. NEW ALBANY, Ind. (April 16, 2018) – Indiana University Southeast recently announced the naming of the Hugh and Patty Cress Lobby at the Paul W. Ogle Cultural and Community Center. 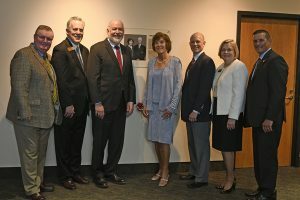 At the dedication ceremony on April 14, prior to the Louisville Orchestra Concert, Chancellor Ray Wallace recognized the Cress’ 22-year dedication to IU Southeast and the Ogle Center as volunteers, members of the Ogle Center advisory committee and donors to the center. The gift leaves a legacy in honor of Indiana University and the arts, while serving the patrons in Southern Indiana who enjoy the programs of the Ogle Center. The Cress’ have a long history with IU Southeast. They first met as students at the IU Jeffersonville extension in 1968, only to reconnect on the Bloomington campus in 1969. They graduated from IU Bloomington in 1970 and both earned master’s degrees in education from IU Southeast, Hugh in 1972 and Patty in 1977. Following careers in education and public service they retired early to commit to a life of community service, supporting organizations throughout Southern Indiana. Hugh Cress passed away on February 26, of this year. A celebration of his life was held in conjunction with the dedication. In his recognition of the Cress’, Wallace said, “Hugh and Patty Cress were successful graduates of IU Southeast who took it upon themselves to give back of their time over many years. They now go even further, with a generous gift to assist IU Southeast and the Ogle Center to advance its mission in providing quality music and performances for the campus, its students and the greater community of southern Indiana”.